UKIP’s Nigel Farage was branded “sexist” after his “failed attempt” to woo women voters in his surprise appearance on ITV’s Loose Women. Shortly after the Labour Party’s ‘pink bus’ gaffe and Cameron’s “patronizing” women’s magazine interview, Farage is the latest politician to attempt to win over female voters. 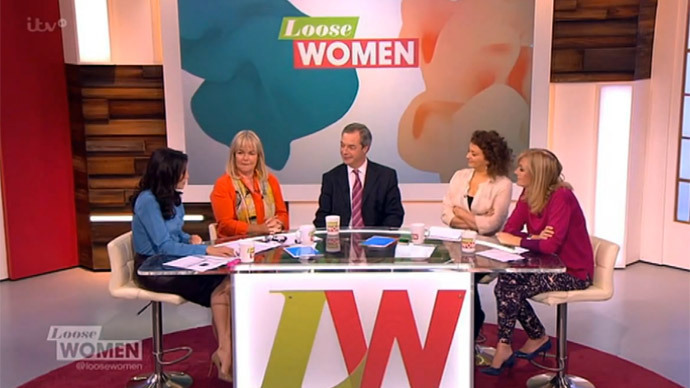 Things didn’t go to plan for Farage on Thursday’s Loose Women when he was interrogated about his family life, health, drinking and why he has been named as Britain’s most hated man. He admitted his own family life has suffered because of his career in politics, adding he had to be a “selfish” person to be a politician. After begging the Loose Women presenters to have mercy on him, Farage said it is a “fact of life” some new mothers will “fall behind” in their careers. Loose Women’s Andrea McLean questioned “blokeish” Farage on what he could do to “bring more women on board,” after he had previously commented that women are not “as useful” to employ. “If you’re a doctor, a lawyer, a researcher, you’re a women, you have a baby, you take six months or a year off, and you come back. You are not disadvantaged at all in that job,” Farage said. “How any woman could vote for a sexist tw*t like Farage is beyond me,” another user added. “You and your party are racist and sexist homophobes,” another user said. Farage, who admitted “UKIP will not win” the election was asked why he has been named Britain’s most hated person. “I’m a bit like Marmite [popular vegetable spread in the UK], people either like me or they don’t like me, and that’s fine,” he replied. Well, I didn't do too badly on @loosewomen , did I? It was good fun! Farage’s modesty prevailed on LBC radio on Friday, however, when the UKIP chief said: “I’m not the messiah, I’m a very naughty boy,” after an obsessive fan said he was “sent by God” to save Britain from the EU.